I thought it was about time to give you an update on what has been happening at the Shed in 2018. It is probably a little late in the year for an update, but as you know everything is relative to the time available. Anyway, we still have our hand up for access to the Warners Park Centre as part of the re-purposing of the former Northbridge Bowling Club site. Willoughby City Council has had their Development Application approved for the future use of the Men’s Bowling Club building as a Cafe and Community Hall. An Expression of Interest process for access to these facilities is planned for early 2019. Hopefully, following this, we will be able to put in our own Expression of Interest for the Warners Park Centre. 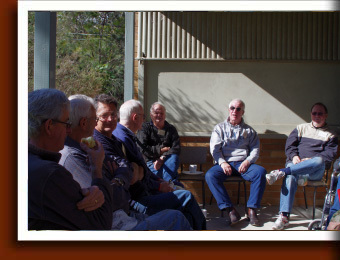 It is hoped that the current main user of the Warners Park Centre, the Out of School Hours group, will express interest in moving to the Mens Bowling Club building, giving the Shed the opportunity to occupy the Warners Park Centre. In the meantime we are going on with planning for the relocation of equipment and the refurbishments needed to the building. We have a great range of options should we be lucky enough to occupy the building. I think this is a watch this space event. Back in the current building there a quite a few things going on. 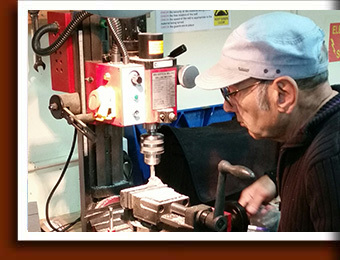 As you will be aware we have had a number of maintenance issues with our machinery. 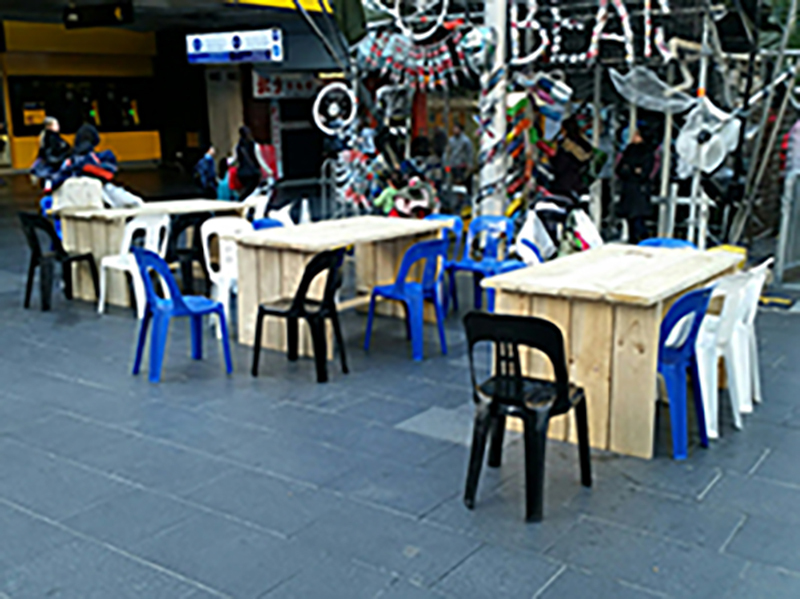 During 2017 we acquired an horizontal sander and a replacement thickness and, earlier this, year we recieved a grant from Chatswood RSL to replace our table saw with a "Saw Stop" table saw, providing a much increased level of safety in this area. 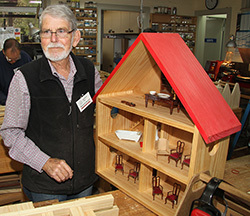 The Shed's relartionship with Mary's House, "A shelter in the North Shore of Sydney supporting women and their children who need help because of domestic violence", has become a key community support activity, with Members making Cutting Boards, Dolls Houses and Model Car Garages as gifts for Mary's House clients. Members also prepared and assembled around 180 pencil boxes for Operation Christmas Child in conjunction with Willoughby Park Anglican Church as well as Year 6 Graduation Crosses for students at St Thomas Catholic School, Willoughby. 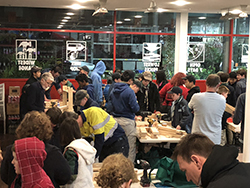 Again, this year, we have been called upon by Bunnings Warehouse Chatswood to prepare materials for and to run their Mothers Day and Fathers Day Family evenings, as well as a local Scout model boat building evening. 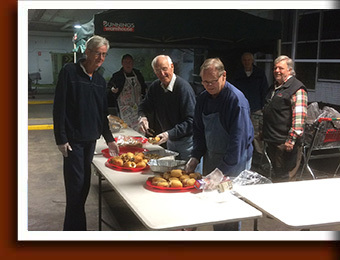 The Shed's involvement with Bunnings expanded this year, with Bunnings Artarmon requesting the we run a Fathers Day activity with them. The Shed's support and willingness to participate in these activities has further strengthened our partnership with Bunnings and we greatly appreciate their ongoing material support for our community projects. The Shed's Little Libraries have been in great demand this year. 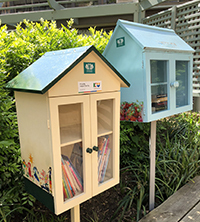 New Little Libraries can be seen at Artarmon Station, at KU Chatswood, next to the Doughery Centre and in Oxley Street, Naremburn. 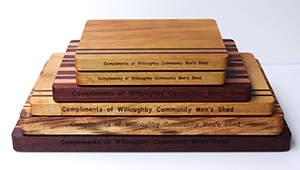 While the Shed was not involved in the Willoughby Street Fair this year we are planning to host a stall September 2019. For this we need to make a range of small but useful items for sale. All ideas for projects to sell are welcome, as are volunteers to make them. Don't forget the Shed principle of 30% your time for Yourself, 30% for the Shed and 30% for the Community. I know we all have competing commitments and quite often our time at the Shed is project oriented, but we all need to make sure we do our bit to support the Shed and the Community. By the way, the other 10% is for tea and coffee breaks.